This article is the entire text of the research paper I prepared for my presentation at the NZ ICT Innovation Conference, held in September 2010 in Rotorua, New Zealand. There are many everyday products that evolved from technology developed by, or for, people with disabilities. There are also many cases where these everyday products are later used or refined to be used by people with disabilities. Other products were designed in parallel – technology finding uses both for specialised assistive technology and in everyday products. This paper looks at some technologies and concepts used by people with disabilities, and how these technologies and ideas have grown from, or with assistive technology. Many of these technologies have become so usual to us that we rarely stop and consider where they come from, and how they could be used differently. By examining what has been happening, we may conceive solutions for all, using existing technologies in new ways, or developing new technologies altogether. This paper focuses on tools and machines (and their relevant software) used to resolve problems or eliminate barriers. 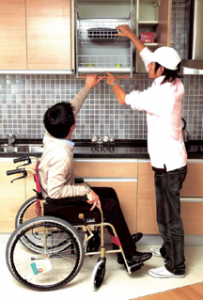 Truly universal design is when disability-related solutions move into everyday use or are incorporated into everyday products, and further development of these solutions become the norm for everyone. A prime example of this process is kitchen utensils with big handles. 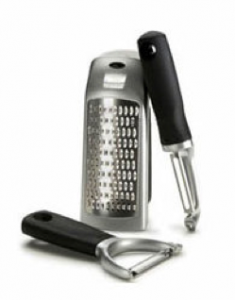 It is now possible to purchase kitchen utensils such as vegetable peelers, can openers, or graters with extra large handles. These products are available in almost every shop, and can even often be found at your local supermarket. These large handles make the utensil easy and comfortable to hold, especially if you use them for long periods. It can also reduce cramping. Many people are preferring these utensils over the ones with smaller, "regular" handles. These utensils are, in fact, becoming the norm, and people don’t realise that these handles are the direct descendants of assistive technology for people with impairments affecting their hands. 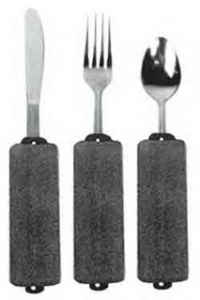 For instance, quadriplegics with limited hand functions or people with arthritis have been using a special foam tube to mold over their utensils to make it easier to grab or hold these utensils. This is a good example of assistive technology moving into everyday use products, as well as universal design. 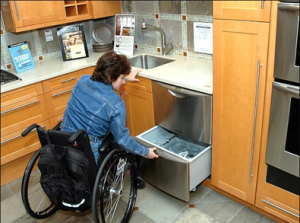 Kitchens are often not very friendly to wheelchair users. One particular issue is cabinets with shelves that are too high to reach. One design becoming more popular is a pull-down shelf, where the entire shelf is able to easily be brought down, and stowed back in its place. These shelves are beginning to be used by people who are naturally too short to reach the shelves. It can also benefit children who won’t be tempted to climb the bench to reach into the shelves. Most larger stores and shopping malls now have automatic door openers. Not necessarily designed for wheelchair users, they do benefit people with mobility impairments, people carrying many bags, pushing prams, etc. This kind of design becomes truly universal, benefiting many groups. Curb cuts and ramps are not really technology per se but are a good example of universal design. 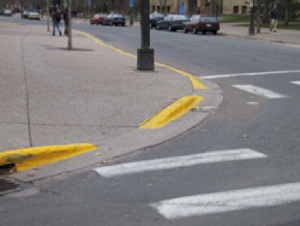 Curb cuts, also known as curb ramps, were initially implemented to allow wheelchair users to get on or off the sidewalk. Now, parents pushing prams, or children on skates have an easier time with street corners as well. Ramps are often an after-thought, added to the design separately, or at the back of a building or a structure. 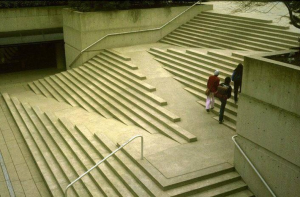 This example shows an effort to integrate the ramp with the stairs. Unfortunately, while the concept is interesting, the implementation is problematic. Wheelchair users would have difficulty using this ramp, but so would any other person using it – inconvenient and dangerous. There can be conflicts between solutions for various barriers. For example, some curb cuts, much favoured by wheelchair users and parents pushing prams, cause a problem for people relying on guide dogs that were trained to cross streets from corner to corner: If the curb cut encompasses the entire street corner, the dog has nowhere to aim and may become confused and lead its charge in the middle of traffic. The ramp winding its way through the steps could be problematic for people with low vision: the steps are not designed properly and it could be easy to miss seeing the steps or the ramp. Universal design, unless carefully planned, may not be so universal after all! Plato is usually credited with the saying "Necessity is the Mother of Invention". This concept is well understood by most people with disabilities. People with disabilities arguably encounter more barriers than people who don’t have impairments. One can ignore some barriers, but the majority of barriers need solutions. It is necessary (or at the very least highly preferable) to come up with ways around the barriers of daily life. A lot of assistive technology is the result of the solutions "invented" to eliminate or reduce barriers. 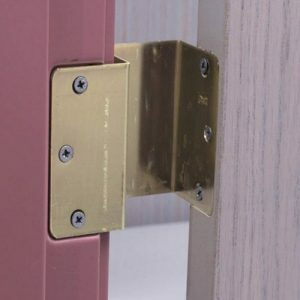 One example among many is the invention of the "offset door hinge". These hinges allow the door to swing away from the door frame, hence expanding the clear opening width. 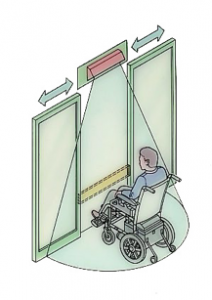 This allows some wider wheelchairs to get through, where the frame is wide enough, but the door itself could get in the way with a regular hinge. Another example is that of MaryBeth G’s wheelchair footrest. MaryBeth uses a power wheelchair because she has Cerebral Palsy (CP). One of the issues with her CP is that one of her feet keeps turning out. Another issue is that her legs are very short, requiring "paediatric footrests". The footrest of her wheelchair was designed to support a foot that would point straight forward, not turning out. As a result, her foot would twist itself off the footrest of her wheelchair. MaryBeth dealt with this problem for over a decade – asking her wheelchair vendors what her options were to find a solution. One day she spoke to me about the issue and pointed out that "if only the footrest was at an angle…". We discussed drilling a hole in the support for her footrest, at an angle, and mount the footrest. This was a relatively simple solution to a problem that had existed for a long time. Margaret Pfrommer was a disability rights’ activist. She died in 1998 at the age of 61 (Ritter, 1998) . Margaret contracted poliomyelitis as a child and was paralysed "from the neck down". She required a ventilator to breathe. I had the pleasure of working with her for many months. She controlled her power wheelchair with a "Sip and Puff" controller. This device is used by many individuals who have impairments affecting both their legs and arms. Christopher Reeve was perhaps the best known person to have used a Sip and Puff controller on his wheelchair (Kluger, 2002) . Margaret was the first to use such a controller, which was developed at the University of Chicago in the late 1960’s (Little, 1996) . This technology has now been used by quadriplegics to sail solo around Britain , Australia , and to cross the Atlantic ("Disabled Sailor | Disabled and Productive," n.d.) . The Sip and Puff technology is not one that has made its way into every day use, but it is a significant advance in technology for people with disabilities. 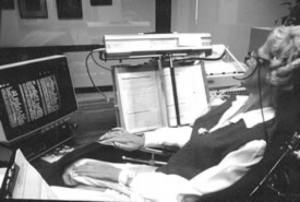 Margaret was also instrumental in the development of communication aids such as text typing or environmental controllers such as book page turners. She also used a voice-controlled telephone exchange and worked as a receptionist using this device (Childress, 2002) . People have tried to invent machines to write for a very long time. There were many different designs that led us to where we are at today. In fact Acocella suggests as many as 52 different designs led to the typewriters we know today (2007) . 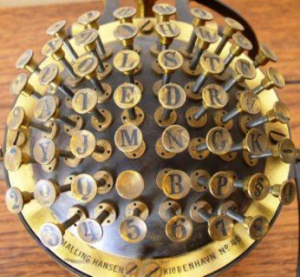 One of these designs was the Hansen Writing Ball, invented by Reverend Rasmus Malling-Hansen. His “typewriter” was the first typewriter to be commercially produced, and was even a commercial success in Europe (Wikipedia, n.d.) . Mr Malling-Hansen was, at the time of the invention, the Principal at the Danish Royal Institute for the Deaf (Wikipedia, n.d.) . According to John Lee Clark, his motivation was: “to find a way for [the Deaf students] to write as fast as they fingerspelled” (2010) . One of the major designs of early typewriters was aimed at people with disabilities. 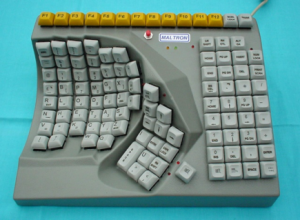 Arguably this design benefited the evolution of they keyboard to what we know today. Speech-to-Text (or Speech Recognition) applications, as the name implies, allows a user to speak to a computerised device, and process the voice into commands usable by the device. One of the primary reasons for developing this was to give greater access to people with disabilities, such as Margaret Pfrommer. From there, other applications were quickly built upon. One of the best known software for Speech-to-Text is Nuance’s NaturallySpeaking, formerly known as Dragon Dictate. This application allows not only the dictation of text into documents, but also allows full control of a PC, including creating/opening/saving/closing files and starting applications. This is ideal when you are unable to use your hands to control your computer. Nuance is now marketing several different specialised versions of their software, including some specifically for professionals working in law wishing to do dictation. They don’t need to send anything for transcription, they can just "talk and it types" ("Dragon NaturallySpeaking Legal," n.d.) . Businesses also benefit from this. Nuance also has specialised medical software for transcription, as well as systems that allows " p hysicians [to] dictate their ‘medical decision-making’ in their own words using the fastest, most accurate speech-recognition product, ever. Review medications or lab results with a single voice command and dictate your comments directly into your EMR. " ("Nuance Healthcare Solutions Real-Time Speech Recognition," n.d.) . I was made aware of an interesting use for Speech-to-Text software by a friend of mine who is Deaf. She told me that her local church had several Deaf or hard-of-hearing parishioners. The church could not afford to hire sign language interpreters, but even had they been able to, not all people who couldn’t hear the sermon were fluent in sign language. The church used a donated laptop and overhead projector to project the output of NaturallySpeaking onto a big screen. The priest was then able to talk to his parishioners, using his usual microphone, which was connected to the laptop (Boos, 2003) . It is a relatively simple and inexpensive solution to a disability-related barrier, using an everyday product which had its origin in assistive technology. Another area of use for speech recognition is in home automation. One can control the volume of music piped throughout the house, the temperature, the lighting, the curtains, and any number of other aspects of being comfortable at home. Using speech recognition, it is even possible to control these things from a remote location (Milward, 2006) – Go on holiday and control opening/closing of curtains and lights, music, TV, giving the impression of someone being there, or turn on the heater or air conditioner on the way home from work with a phone call (HAL, n.d.) . This kind of automation also benefits people with disabilities. It is a "win" for everyone. Speech recognition is increasingly used in automobile entertainment systems, allowing drivers or passengers to control the radio or video in cars (Geyer, 2010) . Ford’s system is called "SYNC" and allows you to "make hands-free calls, control your music and other functions with simple voice commands" (Ford Vehicles, n.d.) . Speech recognition is also a great part of hands-free telephony. With many phones it is possible to speak to the phone and initiate calls, or even conduct online searches. I remember a colleague who was quadriplegic and had this functionality in his phone in 2003. It caused much hilarity as he hadn’t programmed it quite properly and every time he mentioned my name in a discussion, his phone would call me. Despite these kinds of hiccups, the advantages to him were tremendous. This is yet another example of assistive technology moving into everyday use, and those products being used by people with disabilities to increase independence. Text-to-Speech, or speech synthesis is not new. There are legends of Pope Sylvester II having built a "talking head" that could answer questions by saying the words "yes" or "no" as far back as the late 900’s or early 1000’s. In the late 1700’s bellows-operated machines could "speak" vowels. In the late 1960’s, "proper" computer speech synthesis was completed (Wikipedia, n.d.) . These efforts were not in the realm of assistive technologies. Yet a significant part of more recent growth of text-to-speech software came from developing "screen readers" for people with visual impairments. These screenreading applications allow someone who is blind or has poor eyesight to have the computer "read" what is on the screen. The application "JAWS" by Freedom Scientific is probably the best known such screenreader, but other applications such as Windows Eyes or Orca are also available. These complex applications allow interaction not only with text in a document, but also with all menus and controls on the computer itself. Text-to-Speech technology in combination with GPS technology is used in many navigation assistants used by drivers, such as Garmin, NavMan or TomTom (Garmin, n.d.; Navman, n.d.; TomTom, n.d.) . These hands-free devices allow hands-free operation would not be possible without the improvement in speech synthesis / text-to-speech triggered by work on screenreading applications. Other applications using GPS and speech synthesis were developed primarily as navigational assistance for people with visual impairments, such as Loadstone GPS, but can be used by anyone, regardless of level of sight (Loadstone GPS, n.d.) . Loadstone is available for Symbian/Series60 phones. There are many other like applications such as Trekker, Wayfinder Access, etc (Wapedia, n.d.) . There even is an application that combines GPS directions with "augmented reality", available for Android devices. Ford SYNC, mentioned in the Speech-to-Text section of the paper, will also speak out loud incoming text messages. Text-to-Speech has also been used in game development. Dez Lang tells how he was getting frustrated by repetitive actions that didn’t really move his project forward, and how it resulted in him using text-to-speech to ease his workload (2003) . It is also conceivable that major games might use text-to-speech and advanced speech synthesis to reduce the reliance on voice actors. This could give more flexibility in gaming experience for the individuals playing the game – a greater range of options and dialogue could open up based on their actions in the game. I met Dean Kamen in 1999 at the National Council of Independent Living convention in Washington DC . He was demonstrating a wheelchair that could balance on two wheels. He had invented a "balancing technology" based on the gyroscope. This wheelchair could also climb stairs, curbs, or go over terrain often not passable by other power wheelchairs. It was named "iBOT", and produced until 2009, by Johnson & Johnson (Wikipedia, n.d.) . 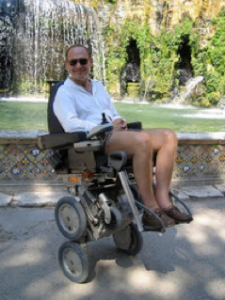 At a cost of over US$26,000 this wheelchair was not as successful as it could have been simply because most people who could benefit from it could not afford the device. Kamen "recycled" the gyroscope technology and gave the world the Segway, "a two-wheeled, self-balancing electric vehicle" (Wikipedia, n.d.) . While the iBOT was not a commercial success, the technology driving this device was used in a tool that is used everyday by people all over the world, including many police departments. 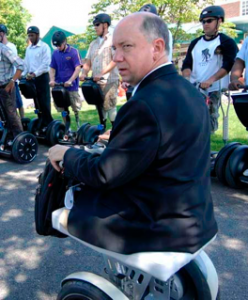 An interesting aspect of the iBOT-to-Segway development is that the Segway is now used a lot by people with disabilities, notably leg amputees. 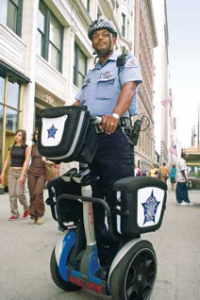 Disability Rights Advocates for Technology (DRAFT), a US-based non-profit organisation began Segs-4-Vets, a programme distributing Segway vehicles to US Veterans who lost one or both legs at war. Used with permission from the Stars and Stripes © 2008, 2010 Stars and Stripes. The study of eye movement or gaze tracking is not new. Some of the early concepts came out in the 1800’s, with the "modern" work done by Yarbus in the late 1950’s. (Wikipedia, n.d.) . Today, eye gazing or gaze tracking is used in many different environments, for people with disabilities, and for the general public. Communication is one of the main uses of eye gaze tracking for people with disabilities. This technology is used for people with Locked-In Syndrome, a condition in which a person is aware and awake but cannot move or communicate due to complete paralysis of nearly all voluntary muscles in the body except for the eyes (Wikipedia, n.d.) . They are able to use their eyes to point at letters or pre-determined phrases on a board. This is often done with the assistance of a human helper who interprets the phrases for the individual who has a disability. More and more, computer-based applications "speak" these phrases for the individual. Such technology was being investigated to allow Stephen Hawking greater communication freedom in April this year (Fox, 2010) . Until now, Mr. Hawking has been selecting letters by hand, and later by twitching his cheek. Image © Jakob Nielsen 2006. Used with permission. 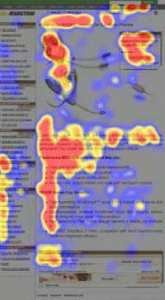 Arguably one of the best known uses of eye gaze tracking in the web development community is to see where visitors look first on a website. This has led to what many refer to as the "F-Shaped" pattern which was discussed at length by Jakob Nielsen (2006) . 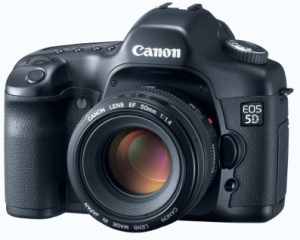 Canon EOS 5D – Features eye gaze focusing. Eye tracking was used for a while in Digital Single Lens Reflex cameras, in particular the Canon EOS 5. The concept was excellent – helping the focus of the camera based on where you were looking through the viewfinder. But the feature never really took off. It has been suggested that this is already a "thing of the past" (Brendant, 2008) . 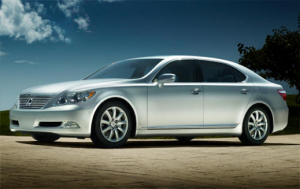 Lexus LS460 – Features eye gaze tracking for safety. Lexus offers safety features in some of their cars, notably the LS460, which use eye gaze tracking to determine whether a driver is focusing on the road or possibly falling asleep (New Car Net, 2006) . One might see it as an "anti-feature", but for people who are driving long hours at night, being alerted by the car before falling asleep and driving off the road is a huge benefit. Vertegaal, Dickie, Sohn & Flickner suggested a design for an "Attentive Cell Phone" – a device that could detect if you’re already in a face-to-face conversation, and could then control the phone’s behaviour for you e.g. sending calls to voicemail (2002) . Again, this may or may not be behaviour you want controlled by a device, but the concepts can be used and re-used. In 2000, a group of Finnish academics proposed "iDict" a Gaze-Assisted translation aid which analyses where the eye stops on the page and suggests definitions of words (Altoonen, Hyrskykari, Majaranta, & Räihä, 2000) . While this has not come through as a commercially available system, it would be easy to see how it would help people learning foreign languages, children with learning disabilities, or people recovering from brain injuries. Over the last few years we have seen more and more ways to interact with computers using only our thoughts. This technology wasn’t developed merely for people with disabilities, but the application of the technology is beneficial to many people with various disabilities. The same person who has Locked-In Syndrome and communicates with eye gaze systems could control environmental systems to increase independence. They could control wheelchairs, lights, doors, email, etc. This sounds like science-fiction, but science-fiction is here! Better yet, Emotiv Systems has a "simple" headset that is used for controlling computers, environmental controls, and can also be used for gaming. These functionalities are demonstrated in the video "A headset that reads your brainwaves" on TED Talk by Tan Le (Le, 2010) . These headsets are relatively inexpensive, retailing at US$300 each. There has been ongoing development of tools / technology to handle barriers for people with disabilities. These technologies often migrate from a "disability-only" use to a wider use by "everyone", in everyday situations. There are many situations where the technology wasn’t specifically designed for people with disabilities, but where it can be used by everyone. What comes next? One can imagine an improvement of existing technology. 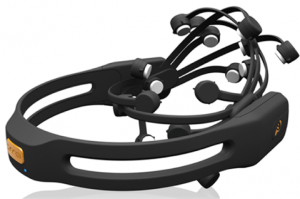 Looking at the EPOC neuro-headset, it is easy to imagine a reduction in size of such a headset, and the development of more applications to be used by all. A doctor who 20 years ago had to get his notes transcribed by a 3 rd party, and can now dictate these notes directly to the computer with an application such as Nuance NaturallySpeaking would be able to simply think his notes. The same hardware and application could be used by quadriplegic to manipulate their environment and gain independence. Perhaps advances in this technology will allow us to do away with the headset altogether. It is conceivable that a silicon chip implanted in the brain could be used for this kind of control. Professor Naweed Syed of the University of Calgary just published his research about such a silicon chip implanted in a brain and being able to interact directly with brain cells through the chip (Calgary University, 2010) . One hopes that the concepts of Universal Design will be adopted by everyone involved in designing new tools & technologies. Such a paradigm shift would likely increase the synergy – providing better solutions and more of them at a reduced cost. Everyone benefits. Altoonen, A., Hyrskykari, A., Majaranta, P., & Räihä, K. (2000). Design Issues of iDict: A Gaze-Assisted Translation Aid. Presented at the Eye Tracking Research & Applications Symposium 2000, Palm Beach Gardens, Florida, USA. Boos, J. (2003, March 14). Church Sermons for Deaf/HoH via Dragon. Geyer, R. (2010, August 13). Speech to text in automobile entertainment systems. Little, J. (1996). If It Weren’t For The Honor.. I’d Rather Have Walked. Cambridge MA: Brookline Books. Vertegaal, R., Dickie, C., Sohn, C., & Flickner, M. (2002). Designing attentive cell phone using wearable eyecontact sensors. In CHI’02 extended abstracts on Human factors in computing systems (pp. 646–647). The Evolution of Assistive Technology into Everyday Products by Nicolas Steenhout is licensed under a Creative Commons Attribution-NonCommercial-NoDerivs 3.0 Unported License. Thanks again for letting me get a sneak peek, and a chance to contribute to this. Don’t forget that blind people had been using PDAs long before sighted people could buy things like Palm Pilots. Because braille embossed on paper takes up so much space, blind people have used portable devices with speech and/or refreshable braille display output for years. They include calculator, word processing, and, these days, email connectivity. Though the iPhone 4 is surprisingly accessible, with voice output capability native to the operating system, and navigation by touch screen gestures. What an excellent discussion, and what great examples – thanks for distilling the issues around universal design and technology so clearly. Especially appreciate the reminder that universal design – when it tries too hard – ends up not being so universally beneficial after all! Last I heard, Stephen Hawking had been trying out brain computer interfaces but says the technology is still slow and prone to error. Eye-tracking devices don’t work for people who, like him, are very active. At the rate that technology is developing, it surely won’t be long until these teething problems are ironed out.